Professor David Daniell (St. Catherine’s College, Oxford, 1949) read English and then Theology, followed by a post-graduate year in Tübingen. His PhD, from the University of London was on Shakespeare. 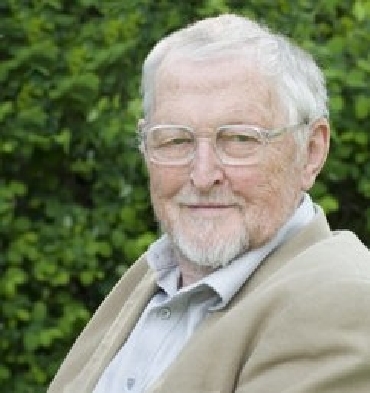 After twelve years as a Sixth Form Master at Apsley Grammar School, Professor Daniell taught in the English Department of UCL, retiring in 1994 as Emeritus Professor. His Fellowships include: a 2-year Leverhulme Emeritus, Visiting Fellow of Magdalen College, Oxford, Honorary Fellow of St Catherine’s College, Oxford and Honorary Fellow of Hertford College, Oxford. In May 2000 Professor Daniell gave the Oxford University Sermon. He has both lectured and broadcast widely (lectures include: Beatrice Warde Memorial, 1994; Lambeth Tyndale, 1994; A. G. Dickens, University of Cambridge, 1994; Hertford Tyndale, 1994; Hilda Hulme Memorial, 1994; Waynflete, University of Oxford, 1996; Staley, Michigan, 1998; St Paul’s Cathedral, 2003; Shakespeare Institute, Illinois, 2005) in Europe and the USA, and published many articles and books. Those on Shakespeare include Coriolanus in Europe, The Tempest (The Critics’ Debate) and the New Arden 3 edition of Julius Caesar. The Interpreter’s House was his first book on the Scottish writer John Buchan, some of whose hundered books he has edited. His major recent work has been on the reformer William Tyndale, starting with an edition of his 1534 New Testament, followed by his Old Testament and a now-standard biography, William Tyndale: a Life all from Yale University Press; and Tyndale’s Obedience of a Christian Man in Penguin Classics. In 1994, the quatercentenary of Tyndale’s birth, he founded, and was first Chairman of the Tyndale Society, now with worldwide membership, from a base in Hertford College. His Bible in English (Yale University Press) is regarded as the definitive account of the many English translations from the Anglo-Saxon times to today.